After his installation ceremony here today, Giani Gurbachan Singh, Jathedar of Akal Takht, emphasised the need for bringing uniformity of “maryada” (Sikh code) in all Sikh institutions and the accomplishment of the desired goals as per the age- old Sikh tenets. 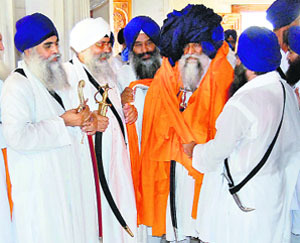 The ban imposed on Giani Iqbal Singh, Jathedar of Patna Sahib, from attending the meetings of Sikh clergy has been lifted by Giani Gurbachan Singh, a few minutes after his installation as the Jathedar of Akal Takht here today. UK-based religious adviser to Giani Joginder Singh Vedanti, Jasdev Singh Rai, today served a legal notice on the SGPC and the union home minister for the “unceremonious removal’ of Jathedar of Akal Takht. Less than a month after the Supreme Court stayed the Punjab and Haryana High Court orders on the CBI probe into alleged elimination of proclaimed offenders (POs) in the Saini blast case, an affected party, Davinder Singh Bhullar, has got back, stating Punjab misled the apex court. Punjab government will have no objection if Panjab University is declared a central university by the the Union government. Sources today said Chief Minister Parkash Singh Badal had approved the proposal. To save environment and raise awareness against female foeticide industrialist and philanthropist, Harpal Singh, plans to distribute saplings and carry water from the sarovar to all the villages in Punjab from the premises of Sri Harmandar Sahib ji in Amritsar from August 27. Former minister and sitting Congress MLA from Baghapurana, Darshan Singh Brar is likely to lose the post of managing director, Moga, Central Cooperative Bank . Following rain in the region for a week, Bhakra, Dehar, Pong and Ranjit Sagar dam reservoirs are gushing with water in their catchment areas, making the power- deficit Punjab State Electricity Board heave a sigh of relief. Many fresh cases of diarrhoea came to light on Thursday in Lohara village in the district even as the Health Department is working day and night to control the disease for a few days. Chief Minister Parkash Singh Badal today expressed grief over the sad demise of Sikh scholar Kharak Singh, who passed away on Wednesday at Mohali. In a condolence message, Badal said Dr Kharak Singh was an institution in himself and would be remembered by one and all for his outstanding services towards Sikh research studies. In his death a void has been created in the literary circles, which was difficult to be filled, he added. With the commissioning of 268 -km Panipat- Nabha - Jalandhar pipeline of the Indian Oil Corporation in two months supply of cooking gas to consumers will become cost -effective and easier. The LPG pipeline has been provided with a functional pipeline linking IOC’s Panipat refinery with Jalandhar. Diesel, petrol and aviation fuel are being supplied to the oil depot at Suchi Pind on the outskirts of Jalandhar in the pipeline. In protest against the alleged highhandedness of the police against medical practioners in the state, the Indian Medical Association observed a two-hour bandh here today. IMA members kept their health centres closed from 9 am to 11 am. Harchranjit Singh Dhami (55), the newly elected president of radical Sikh organisation Dal Khalsa has expressed his belief in ideological and principled politics. Just over 24 hours before the presentation of awards for excellence in literature and journalism by the Punjab Government, the Punjab and Haryana High Court today issued notice of motion for September 17 to the state and other respondents. The Punjab and Haryana High Court Justice, M.M.S. Bedi, has directed the in-laws of Depinder Kaur Hundal, a Canadian NRI, to bring the 10-month-old infant before the court tomorrow. The Shiromani Gurdwara Prabandhak Committee (SGPC) has no powers under the Sikh Gurdwara Act, 1925, to create a Trust, including the one for the Shahabad-based Miri Piri College of Medical Education and Research, Shahabad residents have claimed.